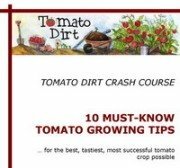 Plan to tie up tomato plants soon after your tomato stakes or tomato cages are in the ground. Tying prevents branches from breaking. You may not need to tie branches soon after staking, but don’t be lured into complacency. Watch tomato plants carefully for growth spurts, particularly as temperatures warm or after rainfall. The best time to tie tomato branches is when first blossoms appear. You can also keep a watchful eye on branches. When they grow in length, get heavy, or bend down, it’s definitely time to tie them to the stake or cage. One of our favorite products to use to tie up tomato plants are tomato ties – either purchased or made from roll flagging tape. (Read more about tomato ties.) You can also used standard gardening tape. If you use twine, fishing line, or rolls of tomato tape (gardening tape), you can tie up an entire plant at once. This is particularly helpful when a plant gets to be three feet or larger. 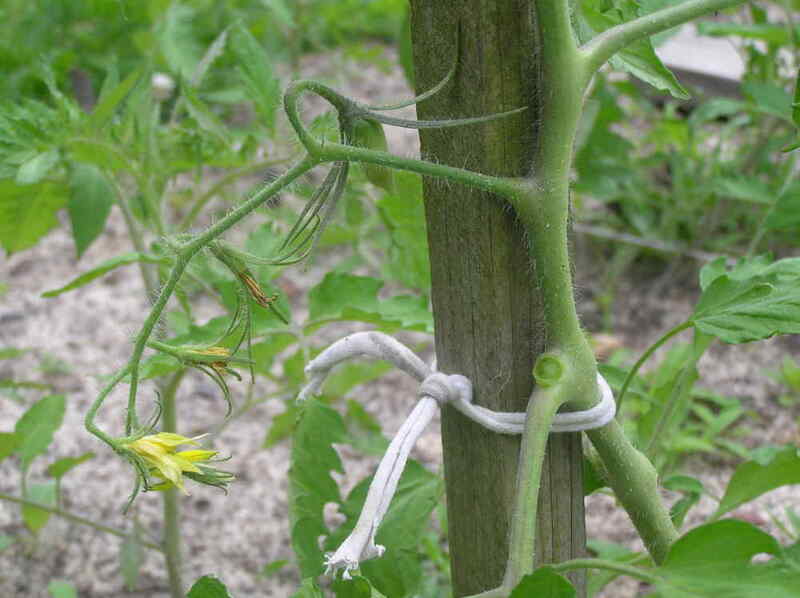 Attach the tomato tie to a lower branch securely and then weave the tape around the entire plant. Support each branch at its strongest point and then wrap the tie around the stake or cage wire before moving up to the next branch. Knot off the tie at the top of the stake or cage. Plan to tie up tomato branches regularly during growing season, particularly indeterminate tomatoes which will continue to put out stems and leaves until frost. Determinates, of course, produce their fruit in a short time period and then stop, so you won’t need to tie them up beyond their main harvest period.